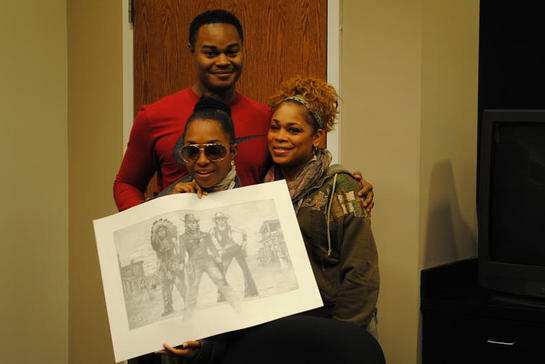 On December 13, 2010, the Lisa "Left Eye" Lopes Foundation (LLF) – with the help of pop superstars T-Boz and Chilli of TLC, Reigndrop Lopes, the New Knerds and Monique Rivarde (the mother of bullying victim Bobby Tillman), came together last week to wrap gifts and raise money for late TLC star Lisa Lopes’ charity at the 5th Annual Celebrity Gift Wrap Fundraiser in Lithonia, GA. The gift wrap began with the New Knerds performing a tribute to TLC, including the songs “What About Your Friends, Waterfalls and Sleigh Ride.” They ended their tribute by performing their original song “Believe In Yourself” featuring Lisa Left Eye Lopes. Immediately following the performance, Monique Rivarde, took the stage and spoke about the events that took place with her son Bobby Tillman, a bullying victim. After the speech, the Directors of the New Knerds movement, Anashay Wright, Ronald Lopes and Kortni Boyd appeared on stage and provided a brief introduction about the New Knerds and the Lisa Lopes Foundation and finally Ronald Lopes introduced on the stage TLC members Chilli and T-Boz. 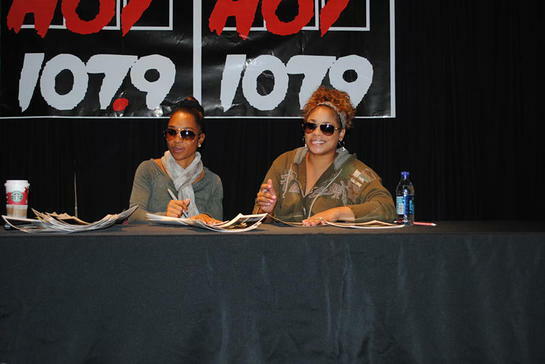 Fans happily received autographs from TLC and Reigndrop Lopes, while the New Knerds sold their cd’s. Lisa Lopes better known by her stage name, Left Eye, was a singer, songwriter and best known as the rapper of the biggest selling female group of all time, TLC. Lopes contributed her self-written raps to many of TLC’s hit singles, including “Aint 2 Proud 2 Beg,” “What About Your Friends,” “Hat 2 da Back,” “No Scrubs,” “Waterfalls,” and “Girl Talk.” She is the recipient of numerous awards including the prestigious Grammy award for her writings. Lisa has touched the lives of millions of people worldwide and continues to do so today through her music and charity, the Lisa Lopes Foundation. Shortly before Lisa passed away on April 25th, 2002, she wrote in her notebook, “I want to give back to the world, what the world has given to me.” Lisa had a passion for giving and helping others and we are honored to continue on with her work. The mission of her charity is to provide youth from low income communities and diverse cultural backgrounds with innovative programs and resources to increase motivation and strengthen their desire to succeed in school and beyond. The Lisa “Left-Eye” Lopes Foundation believes that “positive” music with an inspirational message is one of our best “allies” in the fight for education. In a mission dedicated to youth, community enhancement, education and positive music, LLF has recently added an extension to their outreach initiative. This group is entitled the New Knerds, a group of scholars and teachers from elementary and middle schools in the Metro Atlanta Area.